Mile-a-Minute Project of the Hudson Valley | Lower Hudson Partnership for Regional Invasive Species Management. 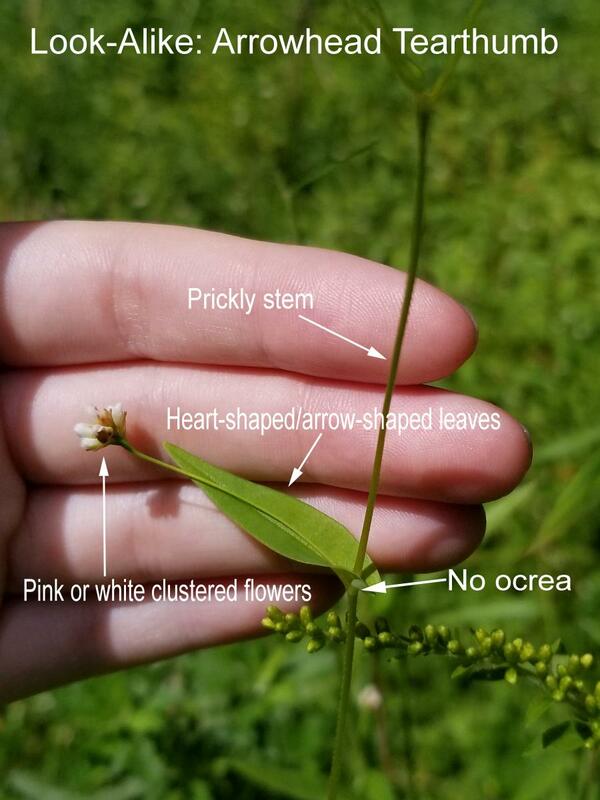 Established in 2005, the Mile-a-Minute Project of the Hudson Valley aims to prevent the spread of mile-a-minute vine (Persicaria perfoliata) through outreach, education and control efforts. 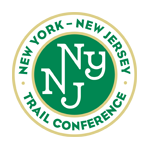 The Mile-a-Minute Project of the Hudson Valley is hosted by the New York- New Jersey Trail Conference and is funded by USDA APHIS. 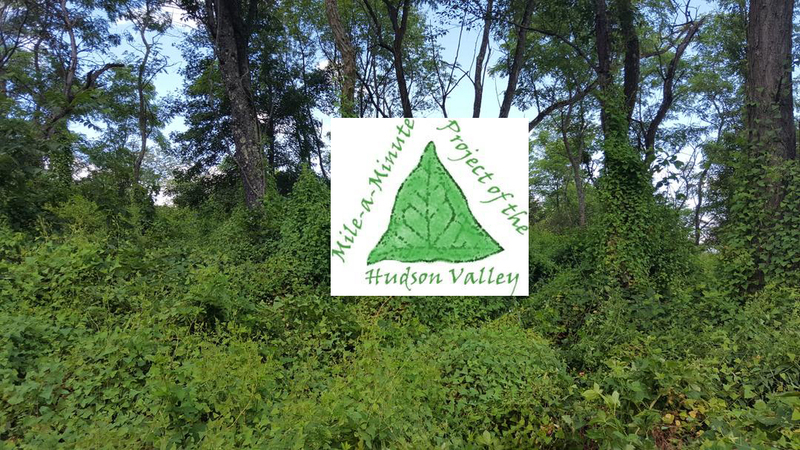 Mile-a-minute is an aggressive, non-native invasive plant that has invaded the Hudson Valley. It grows rapidly–up to 6 inches a day and up to 30 feet in a single year–making it harmful to native species. Its prickly stems and leaves allow it to climb over surrounding vegetation and form dense, tangled mats that shade out underlying vegetation. Wildlife, primarily birds, are the main distributors of seeds. Seeds are also dispersed by water, in contaminated soil and as hitchhikers on clothes, shoes and equipment. Seeds can survive in the soil for 7 years. Because this plant is easily spread by animals, water and humans, it pops up in new places each year. The sooner these small colonies are removed, the easier it is to control the plant long-term. And we need your help to locate these new colonies! If you think you have seen mile-a-minute vine, please contact us. We will get in touch with you to confirm the identification and implement management measures, if possible. Pull out plants and roots. Leave the vines in the sun with the roots exposed. Put all plant trimmings and seeds in black plastic bags and let them cook in the sun for 4 weeks before disposal in the collection site. Note: composting the vines and seeds is not advised, because home composting and many facilities do not reach the high temperatures required to kill the seeds. Monitor the site in the fall, pull out new plants, and repeat each year until no new plants are found in the spring and summer. Herbicide is also effective, but use caution around other plants. Follow the instructions on the label and never spray when windy or above 80 degrees F.
If you have questions or a large infestion on your property, please call or email the Mile-a-Minute Project or your local Cornell Cooperative Extension Association! Caution: do not release seeds in new locations! Check clothes, shoes & vehicles for hitchhiking seeds. 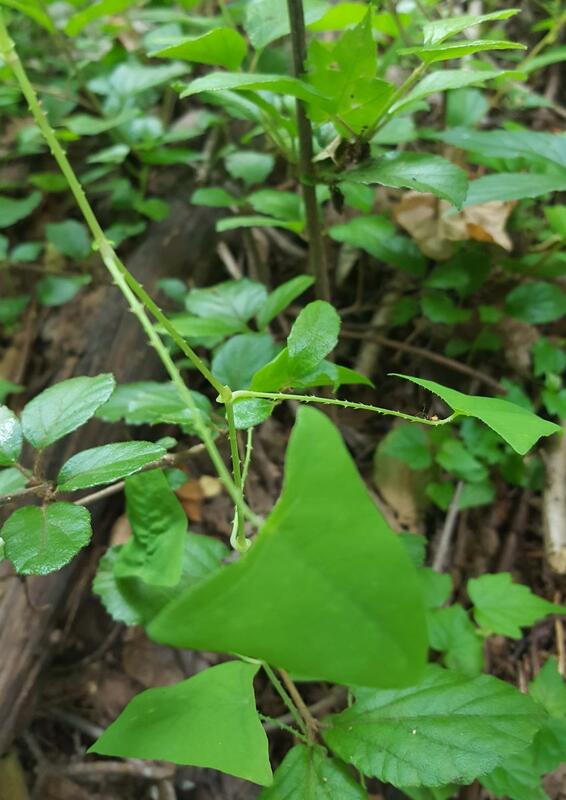 The New York- New Jersey Trail Conference (headquarters for the Mile-a-Minute Project) organizes hand-pulling events to remove infestations of mile-a-minute vine from various locations throughout the Hudson Valley. In addition to land stewardship, these events are an opportunity to mingle with other conservationists, get some exercise, enjoy the great outdoors and learn about invasive plants. Contact us to get involved! 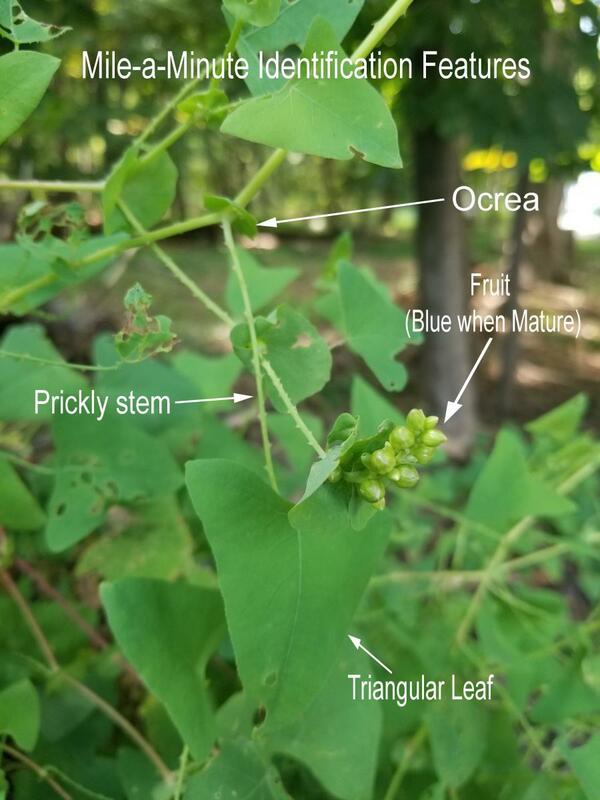 Traditional control of mile-a-minute vine in the United States involves one or more of the following: hand-pulling, mowing, targeted grazing, and herbicide application. To successfully manage the plant and limit seed production, these methods must be employed early and often. Mile-a-Minute is an annual vine, so the roots do not survive the winter. 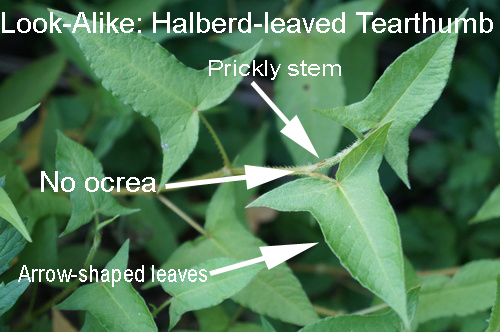 Mile-a-minute seeds remain viable for many years, making seed dispersal hard to eliminate completely, especially when in contact with the vine. Both the green seeds and the ripe blue seeds are capable of growing. In 2004, a biocontrol agent was approved for use in the United States using an insect, a 2 millimeter long, stem-boring weevil (Rhinocomimus latipes L.) Weevils can travel up to 10 miles per year, colonizing new patches of Mile-a-Minute on their own. 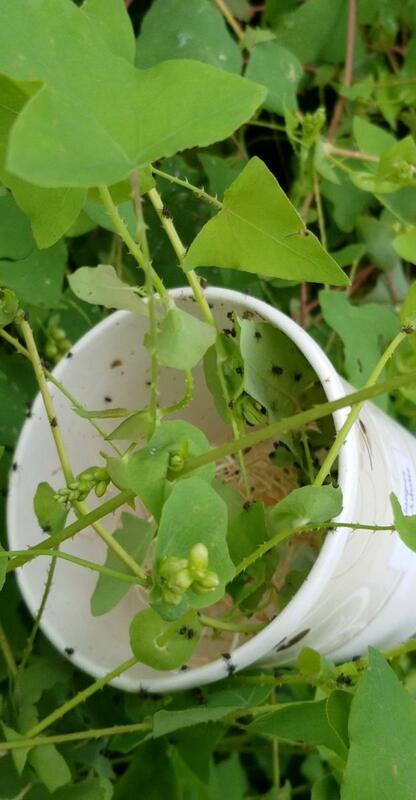 By using the vine to feed and breed, the weevils defoliate and stress the plant, decreasing seed quantity and quality. The weevils are host specific to Mile-a-Minute, meaning they feed exclusively on the plant and will not consume any other vegetation. Results are promising, though it is important to note that the weevils will not eliminate mile-a-minute on its own. Biocontrol combined with another control method, such as pulling, can work to eliminate mile-a-minute faster than either control method alone. Thank you for your help in the fight against invasive plants!In 2009, staff from the Mile-a-Minute Project of the Hudson Valley began releasing weevils–several thousand at a time. 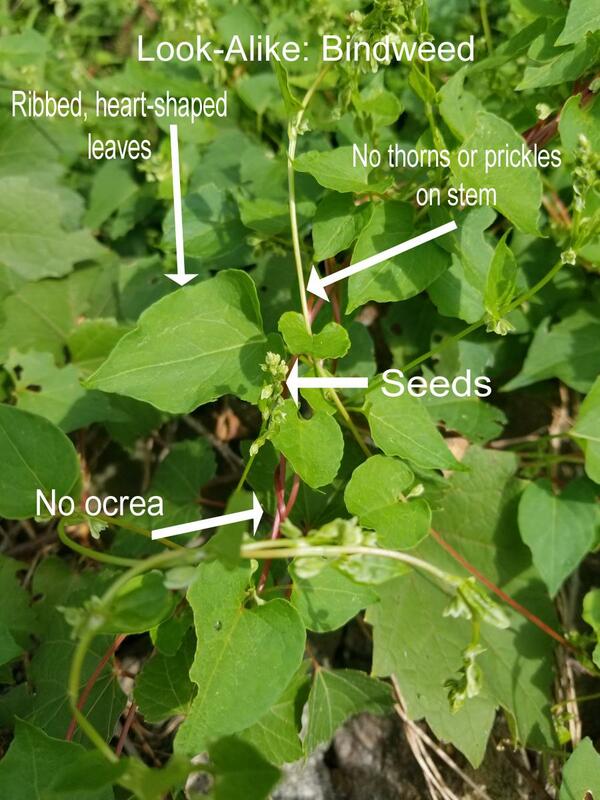 Release sites have are on public lands (including county and state parklands, DEC State Forest, and Wildlife Management Areas) that are heavily infested with the vine. There are now 20 biocontrol sites scattered across the Hudson Valley that are monitored monthly to determine the effectiveness of the insects. Private landowners may apply for permits to release weevils! Contact us for more information.